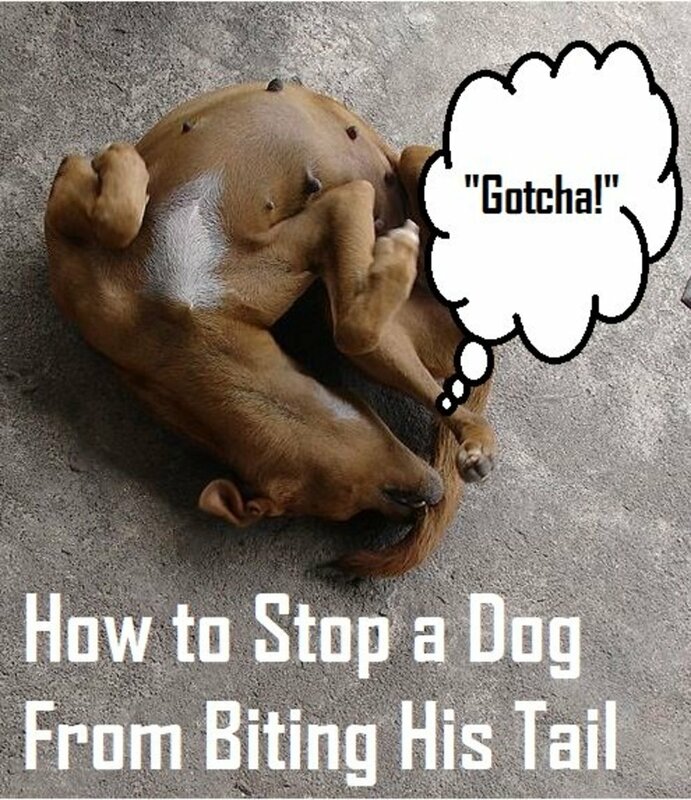 In order to stop a dog from biting his tail, you will first have to investigate the underlying cause of the behavior so that it can be addressed accordingly. Let's face it: From early puppyhood, tails are an intriguing part of a puppy's anatomy. Puppies seem to be somewhat confused by their tail which causes them to often chase it and bite it. As the weeks go by though, most puppies seem to come to terms with their tail's existence. Sooner or later, the tail becomes a less salient stimulus, and the puppy finds more interest in other forms of play. 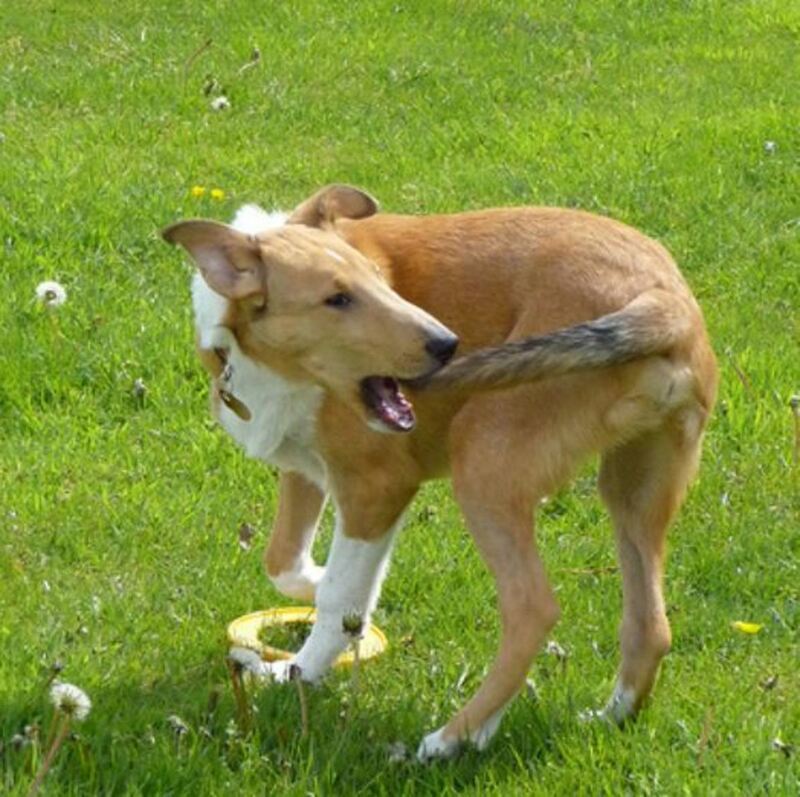 While tail chasing is an innocent game often associated with early puppyhood, in some cases, tail chasing can become problematic. This is often the case when the tail chasing and tail biting behavior becomes excessive and repetitive and the dog cannot seem to stop. In some cases, the tail chasing and biting may occur in one specific context (such as in response to stress or frustration), but then it may spread to other contexts until the behavior is reinforced on its own and appears even without evocation or a particular trigger. 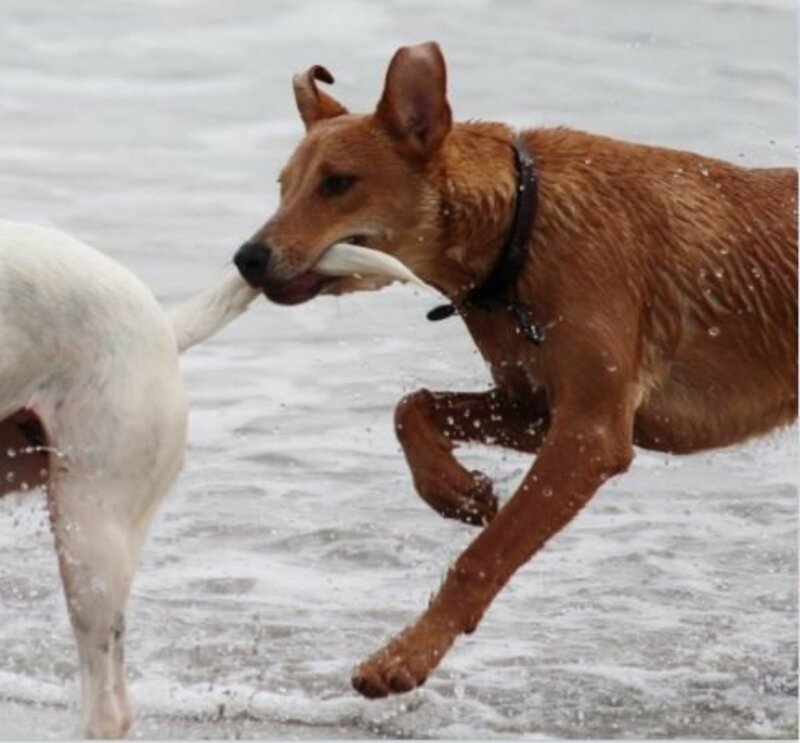 Tail chasing in dogs may be indicative of medical, psychological, and environmental causes, and sometimes even learned factors may be at play. Things may get particularly complicated when tail biting in dogs arises from a combination of factors. 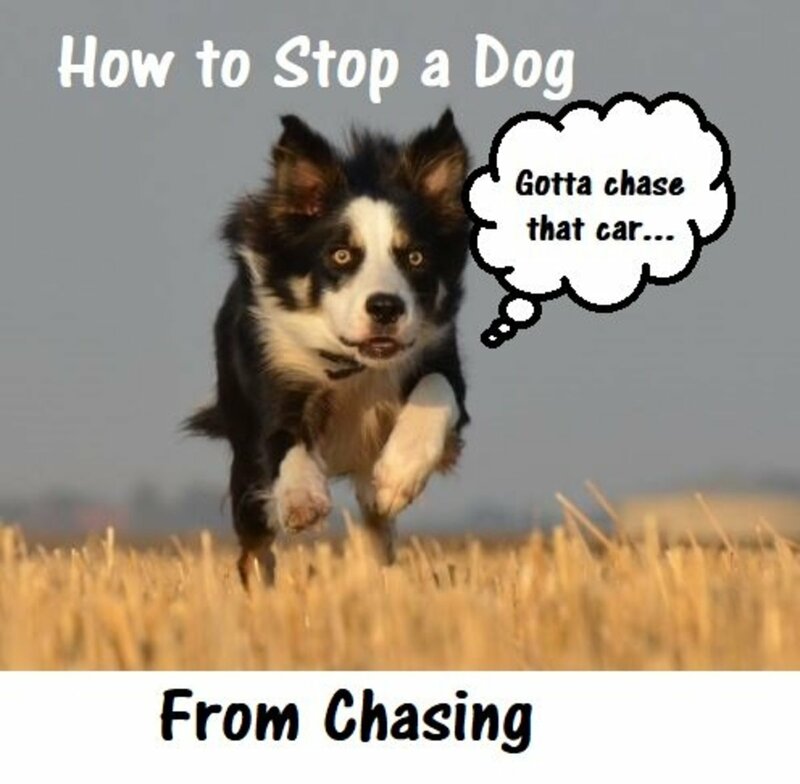 Here are some potential causes of tail chasing in dogs. Tails are so fun to play with! Many dogs have allergies which may develop from exposure to certain allergens such as food or things found in the environment. Finding the underlying allergen causing the problem can be a challenge, which is why vets sometimes opt to simply try to manage it with the use of antihistamines. If food allergies are suspected, a food trial using novel protein sources or hydrolyzed proteins may be suggested. While this food trial is done, it's very important to refrain from feeding the dog any treats or other foods other than the prescription diet. Follow your vet's directions for guidance on this. A variety of possible skin problems may cause excessive tail biting in dogs. Possible etiologies include moist dermatitis, stud tail, neurodermatitis, allergic dermatitis, to just name a few. In some dogs with long, thin tails, excessive wagging and banging of the tail in enclosed areas (small room, crate) against walls or furniture, may cause injuries to the end of the tail. This may cause licking and biting of the end of the tail. Seeing the vet is important. The vet may need a skin scrape to help confirm or rule out some of these dermatological causes. Challenging cases may require a referral to a veterinary dermatologist. 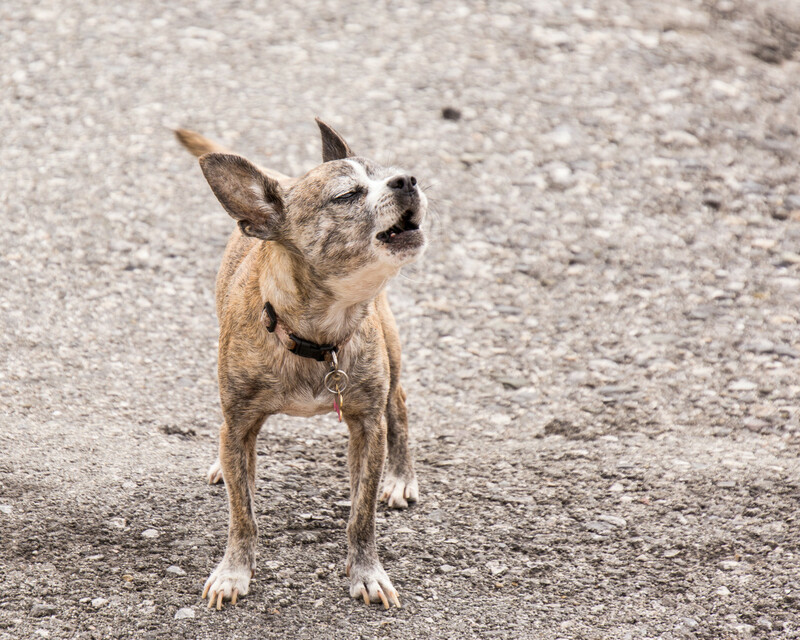 Fleas are one of the top causes for itching in many dogs. One of a flea's favorite biting areas is at the base of the tail. Don't just assume your dog doesn't have fleas if you haven't seen any; fleas are very good in concealing themselves amidst all that thick fur. Some dogs are allergic to flea saliva and even the presence of an isolated flea may trigger intense itching and biting at the tail. Other parasites that may cause itching in the dog's rear end area are tapeworms which release eggs sacs through the dog's bum. 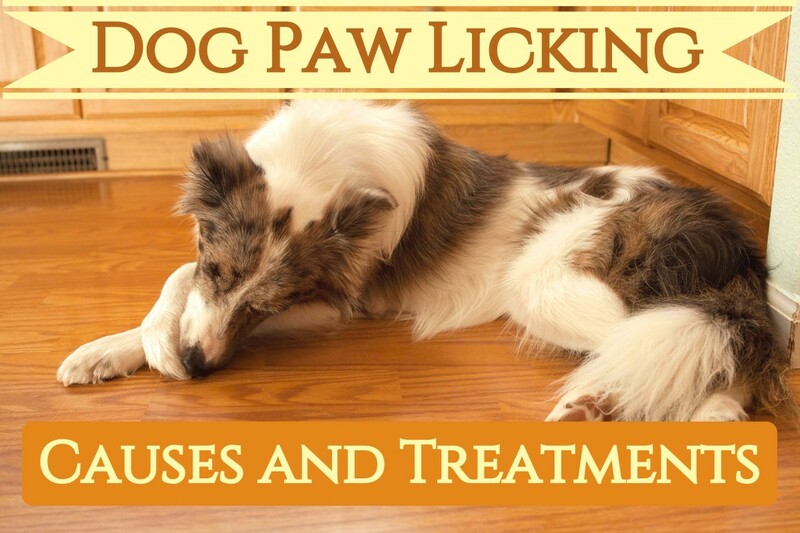 These may cause itching that trigger licking and biting targeted towards the dog's rear. The egg sacs look similar to little grains of rice. The drug of choice to remove tapeworms is praziquantel. 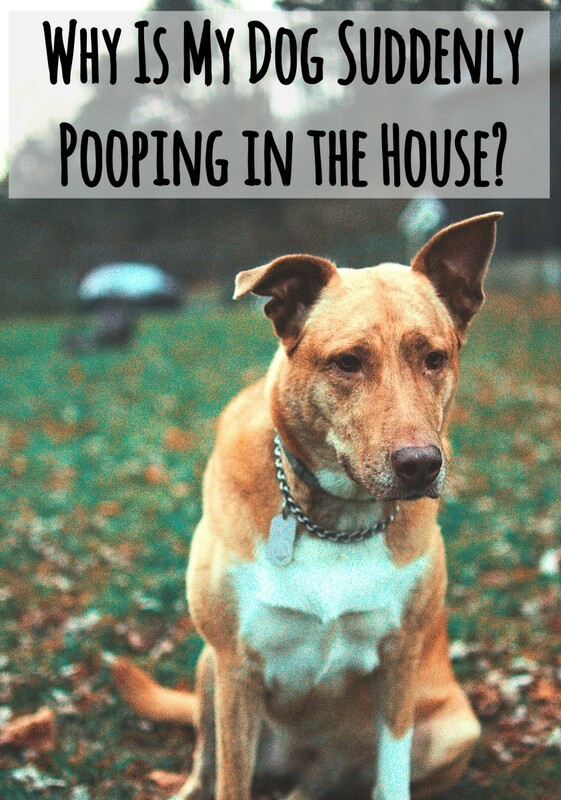 On top of this, it's important to practice good flea control considering that fleas play a role as intermittent hosts in the development of tapeworms. Dogs have special glands located under their tails right around their bottoms. These glands should ideally empty when dogs pass sturdy stool, but sometimes they fail to empty as they should due in part to chronic loose stool, excess weight, conformation, etc.. When these glands become impacted, dogs feel discomfort and this may lead to excessive biting directed towards the base of the tail. Often, there's also scooting. If your dog is chewing excessively towards the base of the tail, have your dog see your vet or an experienced veterinary technician to have those glands checked out and possibly expressed if needed. Sometimes, these glands may get infected and your dog may need a course of antibiotics. Other localized problems involving the dog's bum include local irritation, cuts and presence of foreign items. Hip pain or any pain affecting the dog's hindquarters can be a culprit for tail-biting behaviors in dogs. Disk disease, such as a luxated or subluxated lumbar disk can be a culprit that leads to tail chasing and tail biting. Other than causing pain, this latter condition may trigger tail biting because of the way the dog perceives the associated neurological deficits. Pain can be tricky at times to diagnose, and some vets may decide to do a trial of anti-inflammatory drugs to determine whether it has an impact in decreasing the behavior. If your dog belongs to a breed whose tail is typically docked, consider that sometimes tail chewing in a docked dog may be a sign that the tail docking was done incorrectly. When a dog's tail is docked, a clamp is placed across the tail at the correct length before the tail is docked. Sometimes though, when the cut happens to go through one of the vertebral bones of the tail, not all of the remaining parts of the vertebrae are removed properly. On top of that, any tissue that was clamped down on should be removed and the tail should be stitched up. Problems start when the remaining piece of bone or the skin edges aren't properly trimmed. When this happens, the affected dog may develop annoying sensations, according to veterinarian Dr. Ralston. This type of sensation may be compared to the phantom pain experienced by human amputees and may cause excessive itching, licking and biting of the tail. In affected dogs, you will typically notice a bald spot at the end of the tail where the skin wasn't trimmed correctly. Treatment may involve the use of anti-anxiety medications or surgical intervention to fix the problem which consists of removing the distal portion of the tail and repairing the skin as necessary. In my experience, pain-related discomfort is an often overlooked cause of behavior problems such as tail chasing. Since our patients cannot talk to us and we do not always have the diagnostic capability to identify the presence of pain or altered sensation, it is imperative that we not dismiss these possibilities too quickly." Did you know? According to a study published in the March issue of the Journal of Small Animal Practice, it was found that several dogs who chased their tails had higher HDL and LDL cholesterol levels. The theory behind this is that high levels of cholesterol affect the flow of hormones, such as serotonin, which play an important role in mood and behavior, making affected dogs more prone to obsessive behaviors. Providing dogs with an enriching environment can help prevent psychological forms of tail-biting. 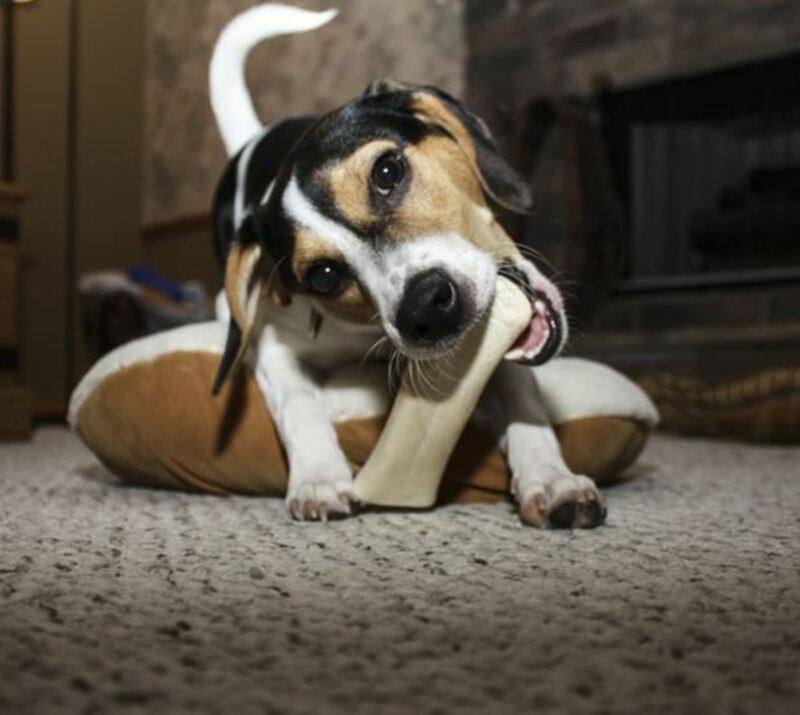 In some cases, psychological causes may be triggering the tail-biting behavior in dogs. It's important to carefully evaluate the dynamics taking place. Psychological causes are often a diagnosis of exclusion, meaning that it's assumed only after a vet has ruled out a great extent of medical disorders. Many dogs who crave attention may learn to engage in tail biting because they are quick to notice that the behavior brings the owner's attention. 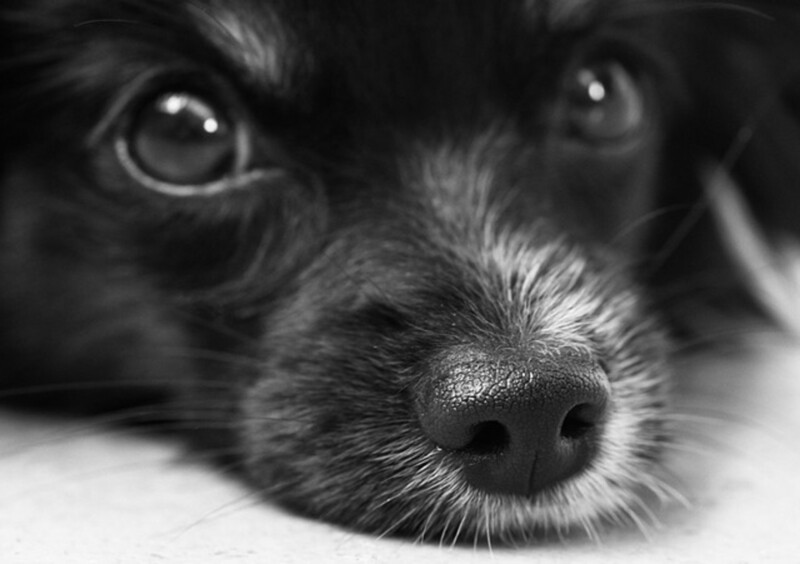 A dog who is socially-deprived may find any form of attention from their owners reinforcing, even the type that one would consider of the negative type. For instance, if a young, energetic dog is left home alone for a good portion of the day, when the owner returns home, most likely the homecoming is the dog's biggest perk of the day. Yet, if the owner ignores the dog and just plops in front of the TV, the dog may feel frustrated because he has lots of energy and wants to play or maybe wants to go on a walk. So, the dog may try to figure out ways to get any type of attention. He may bark, yawn, scratch himself, and then he may just start chasing his tail and engage in tail biting. Bingo! Whether the owner laughs, makes a remark or scolds the dog, the dog has attained what he wanted. Interaction! The owner looked at him, talked to him etc and that made the dog's day. With this discovery, do you think the tail chasing behavior will increase or decrease? It will increase because it was reinforced with attention and it also likely provided some self-reinforcement (dispersal of energy, frustration release). A compulsive obsessive disorder encompasses ritualistic, stereotyped behaviors such as fly biting, flank sucking, and tail chasing and tail biting. Tail chasing as a compulsive behavior in dogs was first reported in Scottish Terriers with a history of being exposed to an environmentally restricted start in life. (Thompson et al 1956). These dogs were housed in isolation cages for 1 to 10 months and exhibited behaviors such as staring at the tail, tail chasing and growling. Possible underlying causes of compulsive obsessive disorders in dogs include living in impoverished conditions and exposure to conflict, frustration, and anxiety-evoking stimuli or situations. Boredom, separation anxiety, inability to cope with frustration, excess energy, lack of stimulation, and lack of environmental enrichment are all possible conditions that may trigger tail biting, and in some cases, also facilitate the onset of obsessive compulsive disorders. Sometimes, dog owners (inadvertently or purposely) encourage the behavior for entertainment purposes, which only exacerbates the behavior and makes it more difficult to eradicate. Allowing the dog to repeatedly bite his tail is counterproductive. The more the dog is allowed to chew, the more damage the tail area sustains. This increases the chances for an infection which will only aggravate things. 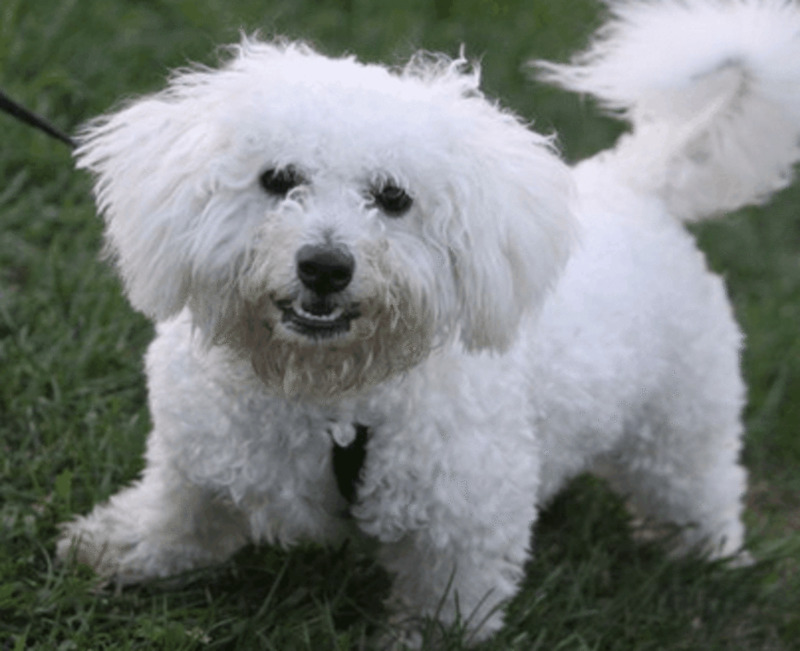 To stop a dog from biting his tail, it is important to treat the underlying medical condition so to go to the root of the problem if it's occurring secondary to a health issue. For instance, if fleas are a trigger, see your vet for products that are safe to use. If there's a skin condition, your vet may prescribe products to help the skin heal. Seek veterinary care to rule out a medical condition and treat any underlying problems. There are several more potential medical causes of tail biting in dogs that aren't covered in the list. An example are focal seizures. For persistent cases, examinations are necessary and the vast battery of tests often include metabolic screenings, complete blood counts, biochemistry profiles, tick titer tests, x-rays, and neurological exams. Consider investing in an Elizabethan collar and use it until the area appears to be healing (no more raw tissue or bleeding and hair is regrowing). Your vet can help you fit one. When you remove the Elizabethan collar after the area appears to be healing, make sure your dog doesn't go back to tail biting. Once medical causes are ruled out, it may help to consult with a veterinary behaviorist for an assessment and guidance. Follow directions carefully. For mild cases, teaching your dog to respond to certain verbal cues can give him something else to focus on. 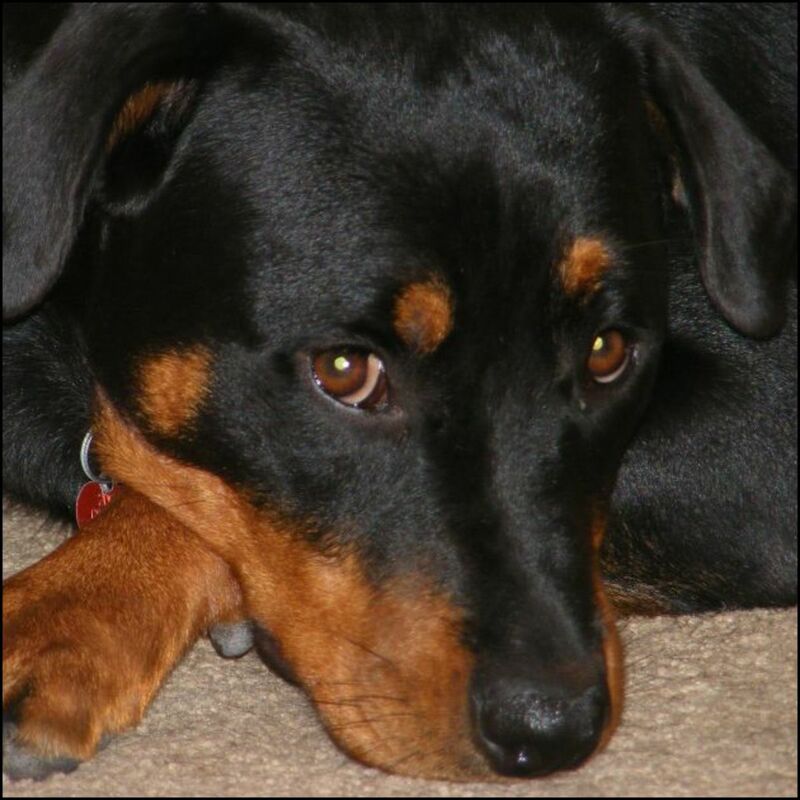 "Leave it" redirects your dog and then "sit" provides an alternate, incompatible behaviors that can help in particular because it's almost impossible for a dog to sit and chase/bite the tail at the same time. Of course, try this only after all medical causes have been ruled out. For boredom, lack of mental stimulation, and excess energy, provide more exercise training and environmental enrichment. Stuffing a Kong with goodies, feed his meals in Kong Wobbler. In other words, entertain your dog! For attention-seeking behavior, ignoring the behavior (expect an extinction burst along the way) is a first step. The owner should ignore the dog's behavior for a period of two weeks, providing attention only when the dog is fed or taken out to eliminate, suggests veterinary behaviorist John Cirabassi. For obsessive compulsive behaviors, dogs benefit from increased exercise, training and mental stimulation, but this is only a part of the solving the puzzle. Managing the dog's environment by preventing access to triggers or situations that evoke the behavior is important. For tail-biting evoked by anxiety, a behavior professional can guide you through how to implement counterconditioning and systematic desensitization and how to effectively redirect the behavior when it happens. Use of a head collar may be helpful in redirecting in some cases. Consider that the use of an Elizabethan collar in a dog with an obsessive compulsive disorder triggered by anxiety may cause more anxiety. Affected dogs need behavior modification. Your vet may prescribe drugs such as Clomipramine and Fluoxetine to be used in adjunct with a behavior modification program. This article is not meant to be used as a substitute for professional veterinary or behavioral advice. If your dog is tail biting excessively, consult with your vet/veterinary behaviorist for guidance.